Two Sisters took on a life of its own and began to gather people from around the area and beyond. Through the years they have grown, evolved, and adapted to changing interests and needs of people, but they have maintained several constants. Another constant is the charm, elegance, and originality of the merchandise and the displays. It is fascinating just to walk through and look. 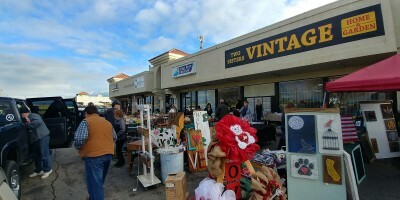 A third is the idea of a monthly swap meet. Every second Saturday of the month, forty venders convene at the corner of Shaw and Academy to set up shop. It is always forty because there are forty spaces, and there is always a waiting list for people who pay $15 to be there for the day. There is no food sold, and there are no clothes nor new items. 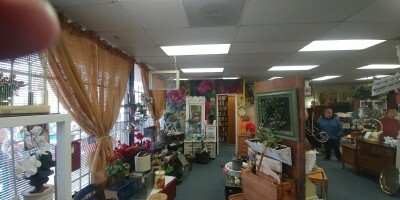 Everything is vintage, craft, or pre-loved. Most vendors have stories. Nia Thompson, a young woman who was exploring Pinterest, discovered how to weave art with yarn. 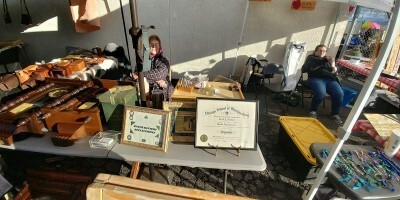 There is Dave Graham of Dave’s Repairs, a certified watch maker. Dave is a retired jeweler who owned his own shop for eighteen years. He only shows his wares at Two Sisters. He makes and repairs clocks and watches which can be done to order and can be picked up at the swap meet. He has no website or Facebook page, but he can be called the old-fashioned way at (559) 403-6191. Dave is one of the last of his profession and a vital part of keeping the trade alive. He is a valuable link in the community of Two sisters. Then there is Hillside Farms. Good luck finding their website. You can find farmers Wesley and Wade Gardner at the Swap Meet. Once a month, they venture forth from Hillside Farms in Sanger to bring produce to the market there. Their featured product is farm fresh eggs. Two Sisters is not only a great outlet for them, but they have a battery of local customers who show up each month just for a dozen or so eggs. You can also call them at (559) 392-9030 or email them at laurengardner@gmail[dot]com. The farm is part of the community that gathers around the strip mall where Two Sisters makes its home. Hans Berger is sometimes there, sharing his book, A Bridge to Cross. Hans’ account of his family’s struggle to survive and thrive is compelling and inspiring. He speaks with authenticity, candor, authority, and love, especially in describing the courage and strength of his mother. I recommend this book for any who need a lift. Hans is part of the community of Two Sisters. Janet, who maintains a book room at Two Sisters, also features local authors’ books at the front counter. 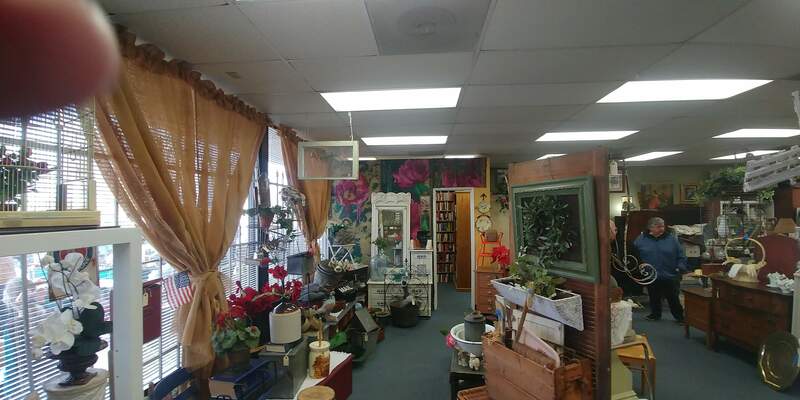 Even another brick-and-mortar thrift shop and online store comes to Two Sisters. Bringing their own specialties, that differ from those inside Two Sisters, they make new friends and find the traffic worth a day at the swap meet. Andrea, who operates An Elegant Yard Sale appreciates the very reasonable price for vendors, the helpfulness of Janet and her staff, the new people she meets, and collaboration with the other vendors. In other words, there is community! Suzan Blair is one of the founders of Two Sisters, and she is one of the two sisters! She has mostly retired from the business operations of the store but maintains a presence there. 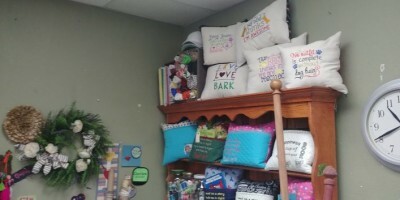 Her mini-factory resides in a corner in the back as “Blair Custom Embroidery.” She creates exquisite designs and embroiders them onto hats, shirts, bags, backpacks, aprons, and virtually anything that will hold a stitch. Suzan can be reached at (559) 289-9391 or by email at suzanblair@gmail[dot]com. She is a builder of the community. 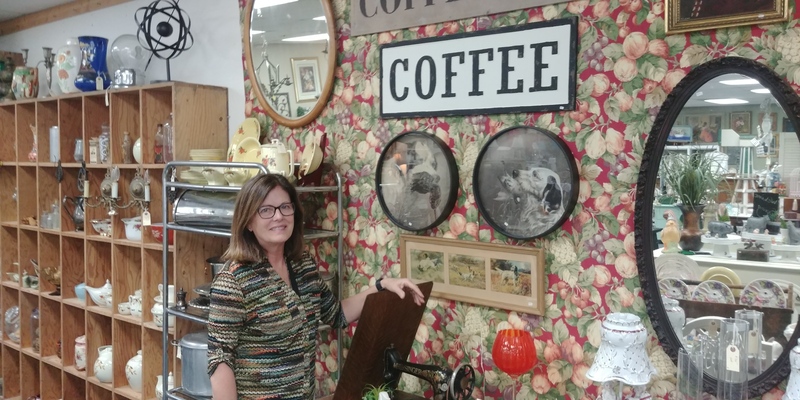 In fact, she plays host to the shopping center that includes Kings River Propane and In the same shopping center, you can have a meal at Red Caboose Café. Red Caboose offers a wide variety of meals for lunch or dinner. They also have pizza. For almost twenty-five years, mostly in Clovis, they have built their own community. Their loyal staff has provided continuity through the years. Their food has helped them maintain their reputation. On many weekends there will be live music. The place is kid friendly and fun. It is also, always open when the swap meet is going. People can wander over there before, during, or after shopping. They can walk a few feet and buy feed for horses or other farm animals. At this corner, there is a community convergence of rural, urban, and suburban. They can move in the other direction to Loma Vista Market and fill their cars with gasoline while grabbing some frozen yogurt, gourmet coffee, a sandwich, Mexican food, chicken, or grocery items. Loma Vista calls itself “Your Neighborhood Convenience Store.” This center of community on Academy between Sanger and Shaver Lake is one mile from Wild Water Adventure Park. Some other things have changed since Kings River Life covered Two Sisters three years ago. Besides Suzan’s change of focus, Janet’s husband Steve retired. For many, retirement means relaxing, but for Steve it means projects. As a gifted and skillful woodworker, he is helping to repurpose items that come into Two Sisters. Some of this involves refurbishing, but it often means using his skills to update, rebuild, or build things from scratch. Janet says that people used to want old things only. 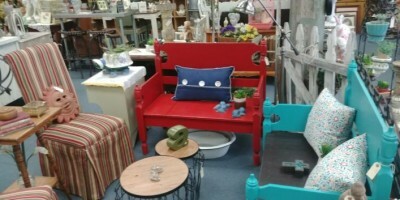 Now, younger people are looking for very useful furniture with character and quality. So, without losing the vintage charm, look, and feel, the store is introducing some more updated options. Janet recently sat down with Steve Walling on Central Valley Talk and explained some of this strategy in a television interview. When I asked Janet what was most special about her work, which she says she loves very much, she mentions the people. People and relationships make the community that Two Sisters has built and is building. She can tell of people who have become good friends, people with stories, people who contribute to the lives of others they meet. She mentions both vendors and customers with a smile and with warmth. The store is open Wednesday through Saturday. The other thing that Janet loves is the time when the store is closed, and she is out in the community on what she calls, “the hunt.” She loves looking around for interesting items to feature on her floor. 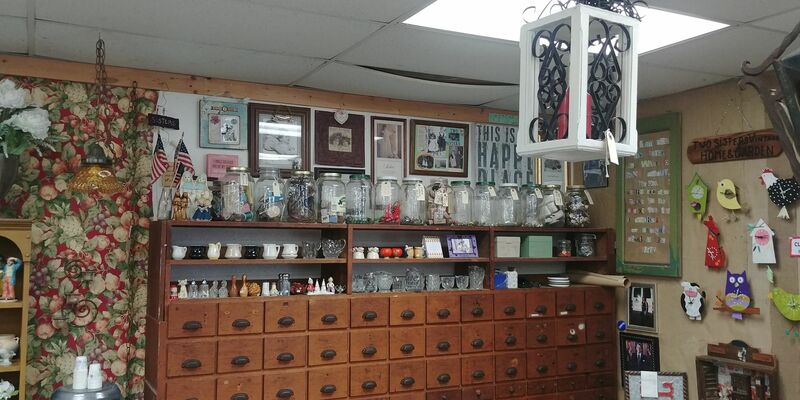 She searches flea markets, yard sales, thrift stores, and estate sales, and then brings the treasures back and arranges them to appeal to the eyes of all who walk through the door. 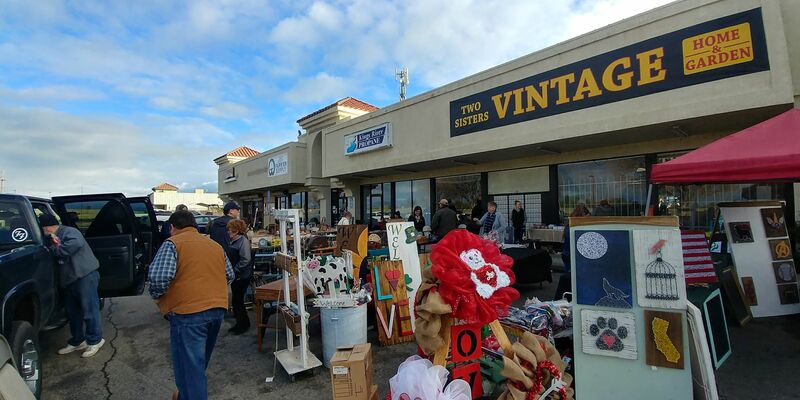 The Two Sisters Vintage Home and Garden Swap Meet is the second Saturday of every month at 5054 N. Academy at Shaw in Clovis, CA from 8:30 a.m. to 3 p.m. The next event in April 13. Find Two Sisters on Facebook. Open Wednesday – Friday 8:30 a.m. – 4:30 p.m. and Saturdays from 8:30 a.m.-3 p.m. Write to them at twosistersclovis@gmail[dot]com. To reserve a spot and become part of the swap meet community, call (559) 298-1699. Myself and Grandpa Jack as he was known by many were two of the first to sell at the Swap meet which started on a cold January Saturday. He is dearly missed. We enjoyed meeting so many great people. The “Sisters” have done so much good for Our Corner. Yes, Red Caboose is a good meeting place, always see someone you know.